VALLEY WEST – In response to requests by area citizens and businesses, the City of Arcata has undertaken an ambitious program of improvements for Valley West, including a new streetscape plan with traffic calming, improved sidewalks and landscaping, a street-camping reduction plan, a trail system, a park, a new housing, industrial and commercial center, Mad River access and a permanent Valley West-based police officer. On May 20, the City’s Community Development department held a meeting at the new Hampton Inn to go over the slate of upgrades and plan for more. One might have expected that Valley Westers would express appreciation for all the attention lavished on their long-neglected section of town. The reception by Valley West residents ranged from skeptical to openly resentful and even antagonistic, with attendees finding all kinds of things wrong with the City’s plans. There was one exception – nothing but praise was voiced for newly-named APD Valley West Officer Brian Hoffman. Layton went into detail abut the roadway improvements, featuring widened sidewalks, bike lanes, new crosswalks and even a mid-Giuntoli Lane pedestrian refuge. Another feature, for camping-plagued Valley West Boulevard, is a permitting system whereby area hotels could issue overnight street-parking passes for lodgers with large trucks or RVs. This aroused the ire of TP Tire owner Carol Dellabalma, who saw the permit system as limiting guests as the hotels. “I’m an advocate for people who drive large vehicles,” she said. 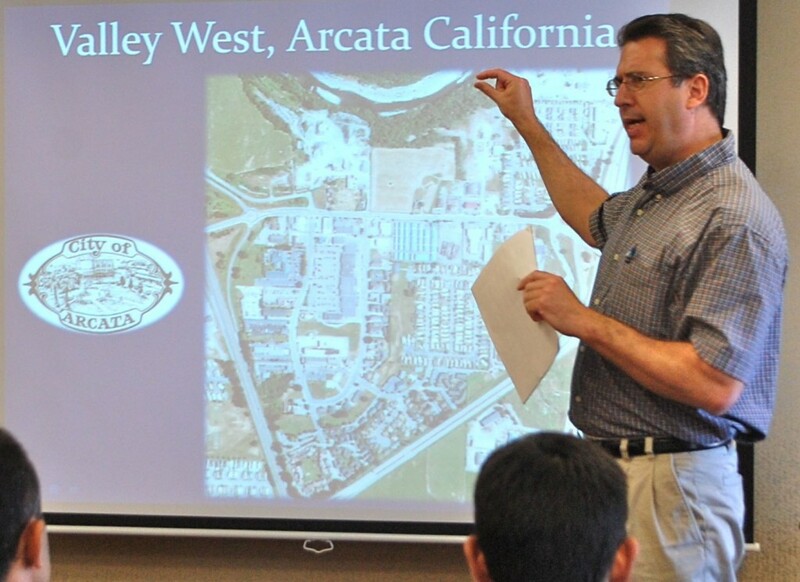 Attendees seemed unimpressed with slides that depicted Valley West as a multi-modal utopia populated by strolling pedestrians, dog-walkers, bicyclists, trucks and lots of trees, all living together in PowerPoint perfection and Adobe Illustrator harmony. Chuck Giannini of the NAPA Auto Parts store said the pedestrian improvements would be a waste, since he sees few walkers in the area. “What is telling us that this boulevard is going to have people wandering around?” he wondered. Slides showing arrays of street tress prompted a question phrased for maximum jab effect, with an attendee asking if the City was going to plant its trees on his private property. Layton responded that the City and property owners would work out landscaping decisions cooperatively. Another man paused between bites of his sandwich to define the nature of that cooperation: “They’ll tell you what to plant and you’ll pay for it,” he said. The planned improvements to Valley West Park will probably render it unusable, attendees opined, at least to anyone other than travelers. The tenor of comments was the polar opposite of those typically heard at City Council meetings and blogs on the subject of homelessness, where Arcata is not-infrequently depicted as an oppressive, civil liberties-squashing “police state.” At this meeting, City officials were cast as hand-wringing, bum-coddling liberals. “I think you’ll see that become a homeless hangout,” said one man. “Parasite Park!” barked another. A woman who said she works at an area business said she is uneasy around Valley West’s panhandlers, and that she likely wouldn’t be comfortable in a traveler-dominated park. A Giuntoli Lane businessman said travelers lounge under the trees, changing their clothes, making rude comments to customers, camping and leaving feces and needles. All in all, the new amenities were cast as nuisance-attractants. “I’m not sure you’re going to bring in people for recreational use with that group begging and pestering people,” a woman said. She said the area is plagued with dubious characters, recently including shiftless young men who ride around aimlessly on bicycles wearing sideways baseball caps. Oetker said that improvements will generally increase use by all segments of the community, and that they shouldn’t be canceled just because some people might abuse them. When Oetker asked for the attendees’ ideas about how to upgrade Valley West, Dellabalma quickly called for removal of one of the benighted neighborhood’s sole concessions to modernity. “Take out the roundabouts!” she blurted. She further complained that the City isn’t enforcing car camping laws. Further demands to “do away with the homeless and parasites” were voiced, with a woman complaining that the City isn’t enforcing the recently-passed anti-panhandling ordinance. Enter Officer Hoffman, for whom the term “beefy” seems to have been invented. The City is slow-walking implementation of the panhandling ordinance following threats by attorneys and civil rights activists who appear spring-loaded to pounce on any implementation and mount what would likely be a costly court challenge to the law. Further, Hoffman said, he can’t break into vehicles and extract the campers. “I’m not the Gestapo,” he said. Hoffman pointed out that conventional techniques had largely eliminated camper vehicles from Valley East Boulevard, and that on most days, the panhandler community consists solely of iconic signholder Alfred “Big Al” Edmunson. This entry was posted on Tuesday, June 1st, 2010 at 5:58 pm	and is filed under News, Community. You can follow any responses to this entry through the RSS 2.0 feed.